Downloads of single copies are for your personal, noncommercial use only. For permission to reprint multiple copies or to order presentation-ready copies for distribution, use the links below. To order, please print and fill out an order form and mail it to PACER Center, 8161 Normandale Blvd., Minneapolis, MN 55437-1044. FREE to Minnesota parents of children and young adults with disabilities. Free to young adults, high school or older, with disabilities and their families. Minnesota tax-exempt organizations that have not ordered from PACER previously are asked to enclose a copy of their tax-exempt certificate. Shipping and handling costs are included in the prices listed. Please allow 3-4 weeks for delivery. Rush orders will be billed an additional amount to cover higher postage rates. International orders will be billed an additional amount to cover higher postage rates. Payment for international orders must be in U.S. dollars drawn on a U.S. bank. PACER provides publications at minimal costs and is not able to provide cash refunds. Credit memos will be issued for any necessary returns. They are valid for three months and may be used toward any item in the Publication Catalog. Catalog published in September 2009. 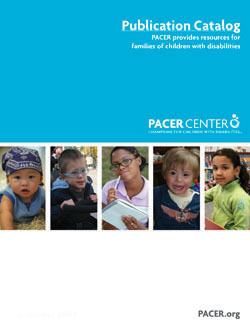 Order the free WHO WE ARE brochure that outlines the projects, services, and resources of PACER Center. Subscribe to PACER's free newsletter, the PACESETTER, that provides an overview of legislation, services and issues affecting special education. Carries articles about children with disabilities, their families, PACER programs, and new technology developments. Published three times annually. Sign up for PACER's "e-news," the monthly electronic newsletter. Results of PACER's most recent fiscal year with details on the goals and structure of each PACER project and level of training. A newsletter for PACER's donors and friends featuring volunteer activities, volunteer profiles, special events, and other special projects at PACER. Published twice annually.